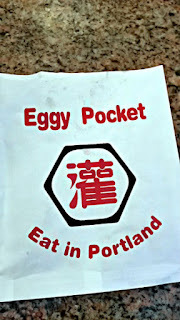 Eggy Pocket is located on SW Washington, in between SW Park and SW 10th Avenue, in downtown Portland, Oregon. Eggy Pocket is another food cart selling bing, a Chinese street food that looks like a savory crepe and filled with various ingredients. 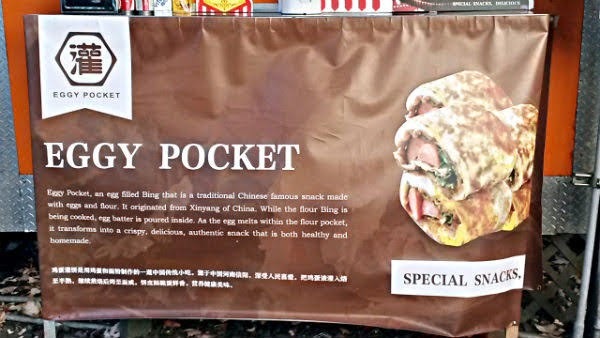 It's like a mini Asian burrito, when you think about it. 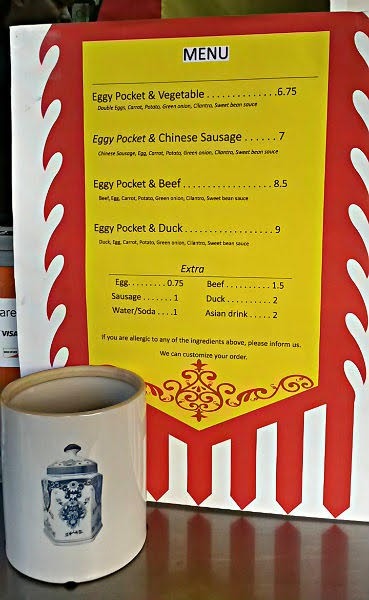 There are various Eggy Pockets here, ranging from a vegetarian option to one filled with duck. 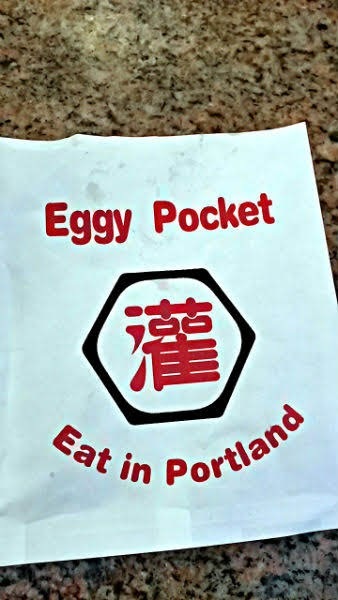 I opted for the Chinese sausage eggy pocket ($7), which also includes egg, carrot, potato, green onion, cilantro, and sweet bean sauce. You can control the spice level of the eggy pocket. Your choice of no spice, mild, medium, or spicy. Do we have to ask what level of spice I wanted? 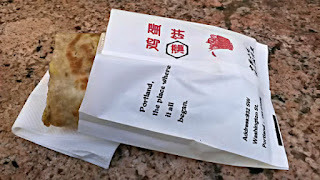 Everything is made to order, and I received my food in about five minutes. Very reasonable. 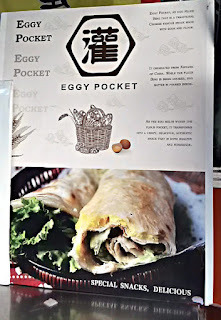 The eggy pocket resembles a mini burrito and placed in a small pocket bag with the cart's name on it. 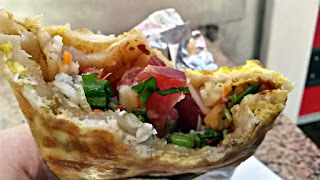 From the first bite, amazing flavor. The spicy option that I chose had mild, pleasing heat. I'd ask if they could make it extra spicy on my next visit. Lots of chopped sausage in there as well. Great crunch from the green onion. 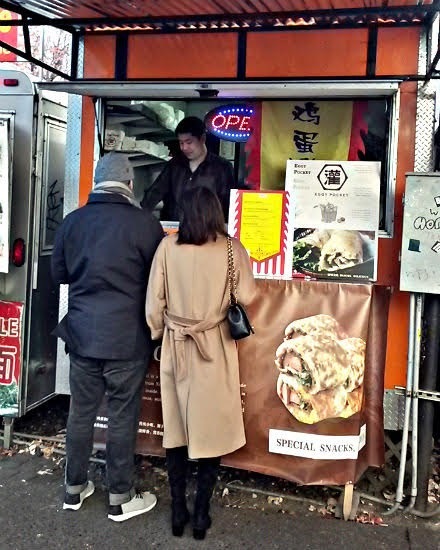 Apparently, according to other reviewers, the owners had previously used hot dogs before switching to Chinese sausage. I applaud the change, Chinese sausage is a vast improvement in my book. 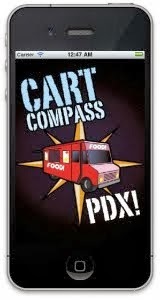 That probably explains the banner in front of the cart, which looked like they had indeed used hot dogs in the past.